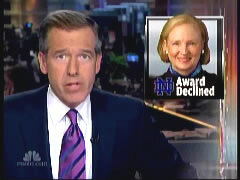 More fallout tonight from Notre Dame's decision to have President Obama deliver the commencement address. Mary Ann Glendon, who was Barack Obama's law professor at Harvard and a former U.S. Ambassador to the Vatican, now says she will not accept the university's highest award because the school is honoring a President whose position on abortion starkly differs from that of the Catholic church. Glendon was to receive the Laetare Medal. First Things has posted her letter to Notre Dame explaining her decision. Harvard's page for Glendon, the Learned Hand Professor of Law, and a bio on her personal site. CNSNews.com story: Pro-Life Harvard Prof Refuses Award from Notre Dame Because it is Honoring Obama.